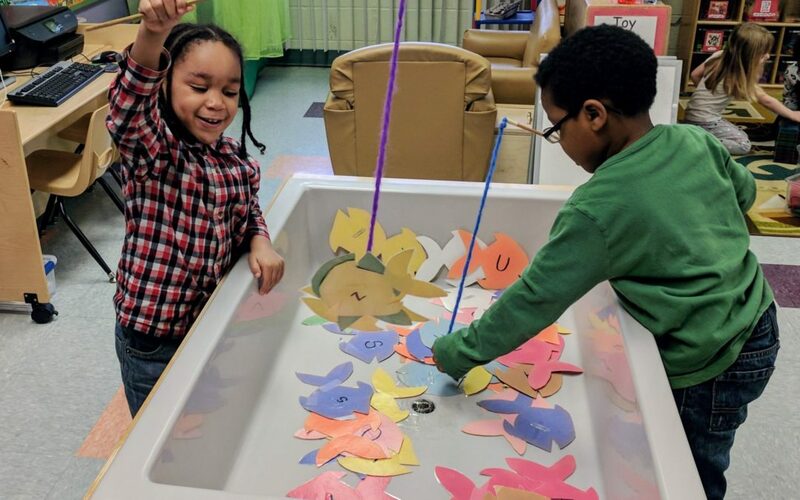 Se’Quay and Malachi students at Council for Economic Opportunities’ Head Start program at Bellaire are fishing for letters and in doing so catching some early literacy skills. The goal of this activity is to both identify each letter caught and then to match the capital letter with its lower case pair. The boys had a great time with this activity. 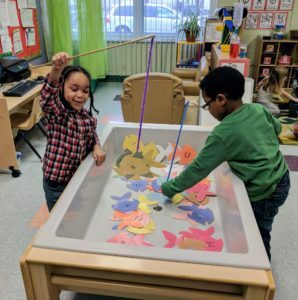 Bellaire Head Start engages students in learning using HighScope Curriculum which uses active participatory learning and the plan-do-review process to achieve powerful, positive outcomes. This approach to learning not only helps young children excel in literacy and cognitive learning, but also to develop the fundamental skills that help determine success in adult life. Speaking of adult life when asked what they would like to be when they grow up: Se’Quay very animatedly responded “a wolf”; whereas, Malachi indicated he would like to play for the Texas Rangers.